The “A Mirror Maze: Numbers in Nature” exhibit at the Museum of Science features a large mirror maze. First, a few hard facts about the newest exhibit at the Museum of Science: It’s 1,700 square feet. It features 30,000 LED lights. It’s composed of 86 large mirrors. Metaphysically speaking, however, the Mirror Maze is much more than the sum of its parts. It can show you forever. 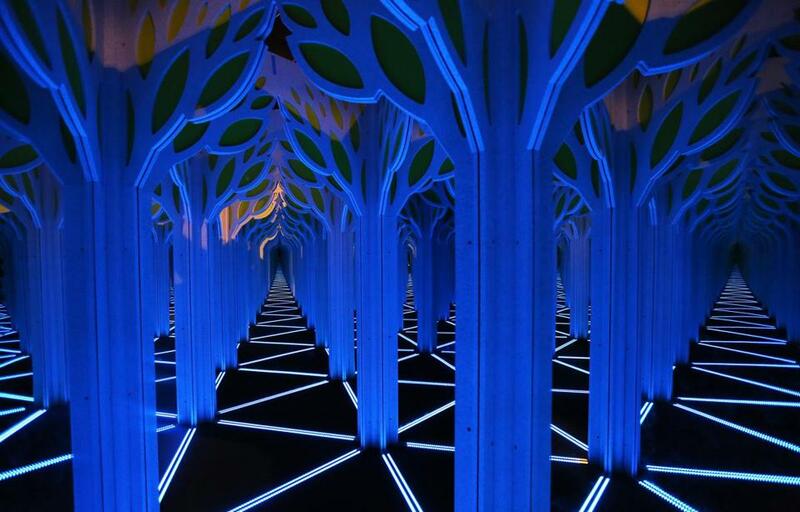 Through the optical illusion of an interlocking network of angled mirrors endlessly reflecting images off each other, the maze offers a profound — and fun — glimpse into the halls of infinity. It’s the centerpiece of a new traveling exhibit, “A Mirror Maze: Numbers in Nature,” that opens Sunday and runs till April 25. The exhibit, first developed for the Museum of Science and Industry in Chicago, aims to demonstrate math patterns as they occur in the natural and physical world. Beyond the maze, various interactive stations consider the orderly cells of a honeycomb, the spiral of a ram’s horns, the nested seeds of a sunflower, and the repeated patterns of fractal branching that answers the question: “How are your lungs like a lightning bolt?” It’s all designed to open our eyes to the boundless patterns around us. 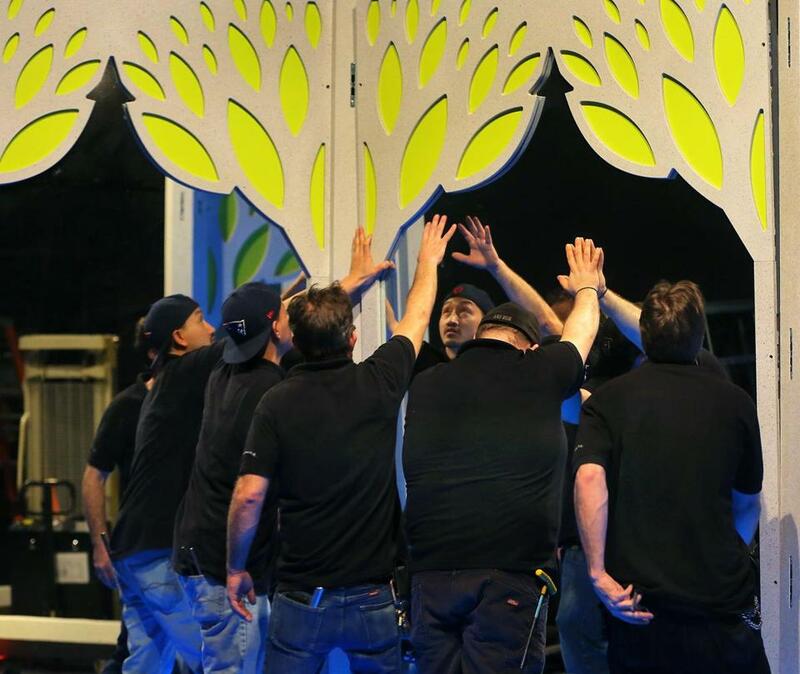 “If you can dream it, we can build it,” said Michael Dutton, one-half of a two-man team from Ravenswood Studio, the Illinois company that created the mirror maze. They design theater sets and museum exhibits. On a recent weekday morning, Dutton and his partner, Jaime Guiscafre, oversaw a crew of local contractors and museum employees who were putting the finishing touches on the maze. “Whose handprint is this?” asked a fabricator in a backwards Patriots cap, feigning outrage. He gestured to a heavy mirror panel leaning on an A-frame glass rack. Though Dutton remembers himself as a curious kid, he couldn’t recall connecting the natural world to the math lessons he learned in school. A crew installs part of the maze. Museum of Science employees noted that the “Numbers in Nature” exhibit provides a logical companion to “Mathematica,” a permanent fixture at the museum since 1981. That display, tucked behind the “Theater of Electricity” on the basement level, features examples of various math concepts, from probability and calculus to the Fibonacci sequence and the Moebius strip. The exhibit, a version of which appeared at the 1964 New York World’s Fair, was created by the revered design team of Charles and Ray Eames. But “Mirror Maze” provides a unique immersive experience, with “twists and turns and dead-ends,” explained Grace Ignarri, who coordinates the museum’s incoming traveling exhibits. Visitors inside the maze, dazzled by the exponential reflections, might bump into a mirror or two trying to figure out which way to turn. Hidden within the maze are several “Easter eggs’’ that reward visitors with bonus puzzles and imagery. Guests are greeted with a brief, continuously looping introduction featuring footage from nature, art, architecture, and human anatomy, explaining how their designs aid in their functions. Together with several clusters of stations that investigate the proportions of the human body, patterns in nature, and more, the exhibit “tries to hit at math from so many different angles,” Ignarri said. Debbie Grossman teaches math and science to fifth graders at Belmont Day School. Each year she organizes a field trip to the Museum of Science. Next weekend, in advance of this year’s trip, she’ll attend a professional development day at the museum for teachers. They will visit the new exhibit and explore the lessons they can build around it. So-called “kinesthetic” learning is critical in STEM education (science, technology, engineering, math), she said. James Sullivan cab be reached at jamesgsullivan@gmail.com. Follow him on Twitter @sullivanjames.